At long last, "At War in the Pacific", has been reviewed." Given the rate at which WWII veterans are leaving us, books like AT WAR IN THE PACIFIC are much needed and appreciated. Without authors like Bruce Petty preserving the memories of our vets, all that precious - and fascinating - history would be lost. 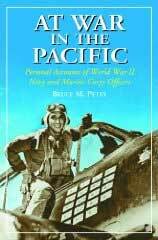 Petty's 2006 volume collects the reminiscences of 21 American and Australian naval or Marine Corps veterans who served in the Pacific. The 21 men range from top-scoring fighter aces to a master rigger. Some served in the tropics; others in the frozen Aleutian Islands. Ship assignments varied: carriers, cruisers, destroyers, minesweepers, landing craft, etc. Some saw much combat; others very little. Several survived ship sinkings or being shot down in aerial combat. It is that wide-ranging mixture of experiences that makes AT WAR IN THE PACIFIC so interesting and valuable. Some of the stories include: Alex Vraciu describing the 19 kills he made in Hellcats, ARIZONA survivor Joe Langdell remembering the Pearl Harbor attack, Ben Cator relating the dicey missions his destroyer-minesweeper took part in, Aussie Mackenzie Gregory describing the disastrous Battle of Savo Island in which his ship and three other cruisers were sunk, Larry Pierce recounting the scouting missions he flown in the Solomons in SOC floatplanes, John Harrington describing life on board an LCI and so on. Petty provides an opening summary of each man's life/service career and then wisely lets the men tell their stories in their own words. Each chapter is illustrated with photographs. All in all, AT WAR IN THE PACIFIC is an interesting, informative, sometimes touching, occasionally horrifying glimpse of naval warfare in the Pacific. Recommended.